Michael Bond, The 'Giant' Behind Paddington Bear, Dies At 91 : The Two-Way "Mr. and Mrs. Brown first met Paddington on a railway platform" — and readers first met Paddington with those words in 1958. Bond, who died Tuesday, turned that bear into an unforgettable friend. 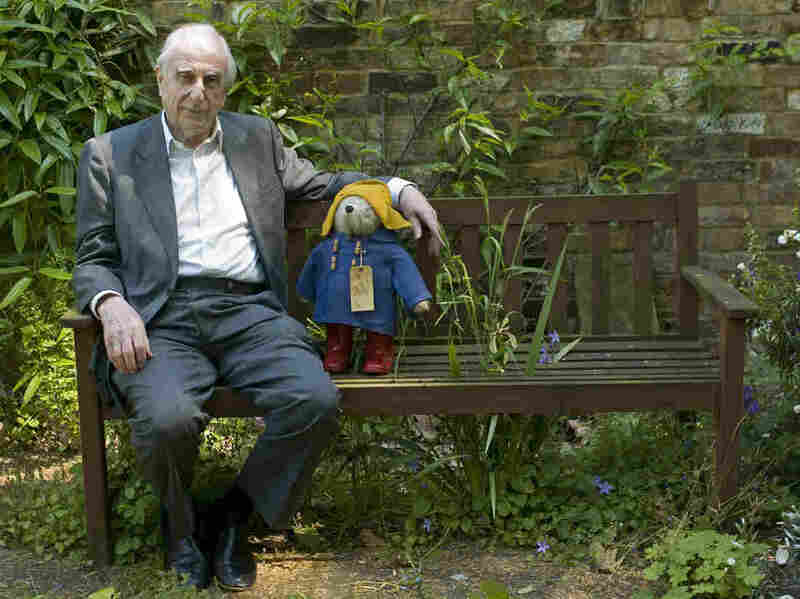 Michael Bond sits with a Paddington Bear toy in 2008. Bond died Tuesday, according to his publisher, nearly six decades after his beloved character first appeared in print. Bond died at home after a brief illness Tuesday at age 91, according to publisher HarperCollins. But that beloved bear of his, which has endured nearly six decades, promises to live on much longer — not only in books but also in the toy stores and screens, both big and small, that Paddington has graced since his introduction. "Michael was a giant of children's literature," HarperCollins UK said in a statement Wednesday. "He was a true gentleman, a bon viveur, the most entertaining company and the most enchanting of writers," said Ann-Janine Murtagh, executive publisher of HarperCollins Children's Books. "He will be forever remembered for his creation of the iconic Paddington, with his duffle coat and wellington boots, which touched my own heart as a child and will live on in the hearts of future generations." Bond was prolific — both with Paddington and an assortment of other characters — and wrote not only for children, but also for adult readers. He published more than 200 books, including roughly one Paddington book a year for the first decade of the series, and Bond's publisher says his books sold more than 35 million copies. But none of that success was foreordained. In fact, Bond, who had been working for BBC radio in the 1950s, got the idea from a purchase he made out of sympathy for a plush toy. While doing last-minute shopping on Christmas Eve, "I came across a small bear looking, I thought, very sorry for himself as he was the only one who hadn't been sold," Bond recalled in the autobiography series Something about the Author. "I bought him, and because we were living near Paddington station at the time, we christened him Paddington. "It was a simple act, and in terms of deathless prose, not exactly earth-shattering, but it was to change my life considerably. ... Without intending it, I had become a children's author." "They all had a label round their neck with their name and address on and a little case or package containing all their treasured possessions," Bond told the paper. "So Paddington, in a sense, was a refugee, and I do think that there's no sadder sight than refugees." As news of his death surfaced, readers took to social media to offer their tributes — as well as a pledge: We'll look after your bear, Mr. Bond. Michael Bond creator of Paddington Bear has died today.